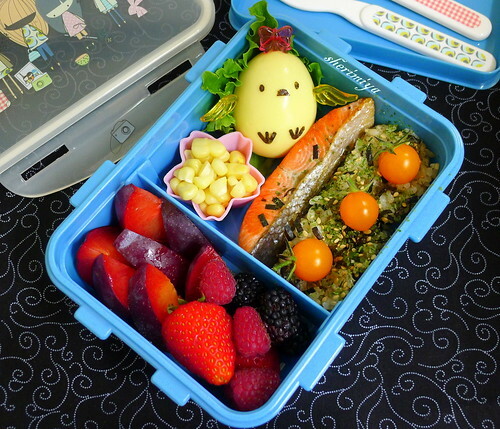 Salmon and Chick Bento, a photo by sherimiya ♥ on Flickr. You've seen this one before, like my kids too. So now when I make a salmon bento I feel like I have to put something extra special in here so it's not quite so ordinary. I try to feed my family salmon (or other fish) at least once a week. Luckily everyone loves fish so it's not a problem. There are lots of sauces you can make to prepare salmon, but I like the simple preparation best. I used to like misoyaki, but we're cutting out soy. Butteryaki, lemon dill and pesto are other good choices, and you can also slather the fish with kewpie mayo, sprinkle some furikake and pan-fry. I've been trying to add rice to TinySprite's bento since she's wheat-free these days, and she's not a big fan, but the furikake helps. 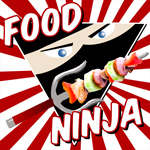 I use an MSG-free variety. I added corn off the cob, and made her a hard-boiled beet-dyed egg decorated as a chick with nori and cute picks. She's a HUGE egg fan, by the way. The other side of this Daytrippers box contains pluots, strawberry, raspberries and blackberries. I hope she finds it delightful! Looks yummy! The wings and bow on the chickie are so cute! How do you make the butteryaki fish? I love fish, but I'm useless at knowing good ways to cook it! All of your bentos are so beautiful!!! When you put the top on and send it with your kids to school, does it stay in place? I can imagine trying to send this and having corn fall out all over the other items in the box (since there is space between the lid and food). Any suggestions?